None of this really matters to me anymore! As one of the biggest cheerleaders for Trump … from the beginning, after this fiasco of a spending bill today, I can think of no excuse or reasoning for what looks like a cave-in to the American Hating Elitists! I say this in accepting his (Trump’s) word that he is going to sign this monstrosity of a spending bill! President Trump announced Thursday he will replace national security adviser H.R. McMaster with former United Nations Ambassador John Bolton. The president wrote in a tweet that Bolton, the hawkish former Bush administration official, will take over for McMaster on April 9. “I am pleased to announce that, effective 4/9/18, @AmbJohnBolton will be my new National Security Advisor. I am very thankful for the service of General H.R. McMaster who has done an outstanding job & will always remain my friend. There will be an official contact handover on 4/9,” Trump wrote. Democrats pushed for, and won, limitations on hiring new ICE interior enforcement agents and on the number of undocumented immigrants the agency can detain. Under provisions written into the bill, ICE can have no more than 40,354 immigrants in detention by the time the fiscal year ends in September. There are dozens more hideous provisions in the bill. It is a democrat bill passed passed with only democrat and RINO votes going to the Senate to be passed with only democrat and RINO votes. Ryan could have had a Republican bill and passed it with only Republican votes. 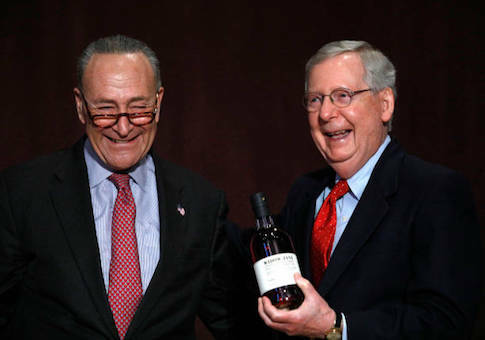 Schumer would have killed it in the Senate and we would have had a Schumer shutdown. Instead it was engineered to make it a Trump shutdown if he didn’t sign. You and I might not mind if Trump shuts it down but he would be pounded by the media and anything beyond a day or two makes a large part of the electorate nervous. The President has to deal with North Korea, an out of control DOJ, an out of control special prosecutor, weasles in his own party quietly hoping to take him down and Paul Ryan has the guts to dump another pile of crap on the President’s doorstep.